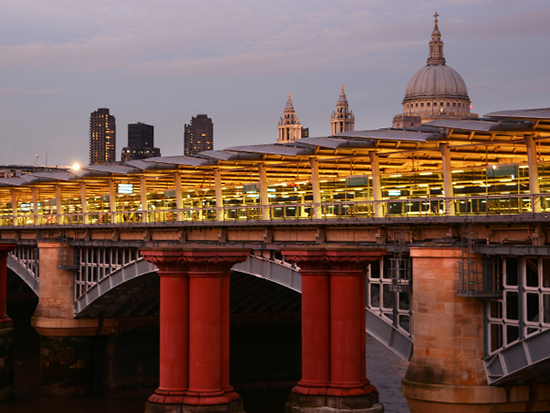 The new construction of Blackfriars Station, situated on Blackfriars Bridge and spanning the width of the River Thames, was a complex modernisation project carried out by Network Rail. As well as increasing platform capacity to trains with up to 12 carriages, the project also incorporated the installation of over 4,400 photovoltaic panels to make it the world’s largest photovoltaic bridge. In keeping with the station’s contemporary vision, glass features heavily in the design. 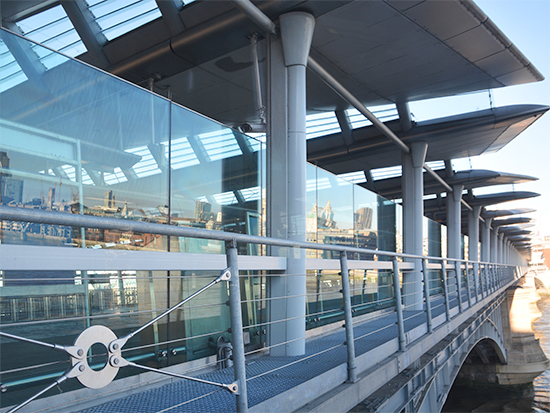 Kite Glass was contracted by main contractors Balfour Beatty to provide toughened and heat soaked glass for the balustrading and wind guarding panels that run the full length of the bridge. Kite Glass’ success in winning this project stems from a growing relationship with Network Rail’s contractors, amongst which the company is gaining a strong reputation as a reliable and authenticated supplier. For this project, Kite Glass’ 20 year experience edging, drilling, toughening and heat soaking thicker glass was seen as a distinct advantage over competitors. With tight tolerances on size, flatness and stress, the technical specification was strict and the 25mm high quality glass supplied by AGC presented challenges requiring specialist expertise in thick glass processing. The project was record breaking in more ways than one, representing the largest order of this glass thickness for a single project in UK history. With the landmark project now completed, the 44,000 passengers a day who use the station can now enjoy a modern, eco-friendly travel experience in central London.